BE WED is the first eco-friendly wedding planner that works well for everyone, regardless of budget, gender or age. The creative system has everything you need to be inspired, informed, and organized while you design a meaningful event that celebrates your shared vision. The Be Prepared workbook handy reference that helps you consider, document, and manage every aspect of your wedding plans. Plus, the workbook's Be Connected section contains a comprehensive index of contacts, web sites, and other resources to help you put your socially and environmentally motivated choices into action. 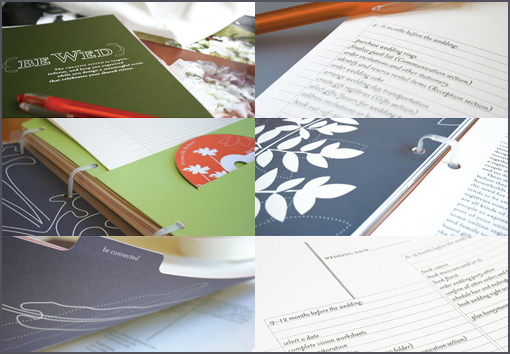 The Be Inspired folder an organizing tool that keeps samples and clippings on hand for future reference and inspiration. The Be Relaxed folder an innovative kit designed for storing estimates, contracts, and invoices. At the end of the planning phase, everything you'll need to manage the big day winds up here, in one portable, organized package. 100% eco-friendly and recyclable. Retails for $49.95 at BE WED! Jenna Ashley and Kathleen Koeneman are both hard-working mothers of small children, who value family, friendship and coffee. They have worked together in the graphic-design industry for over 12 years. Before founding Evotive, llc, both women were art directors for Adobe Systems, Inc. They formed the design team behind Adobe Magazine, a bi-monthly graphic-design publication distributed world-wide, in print and online, and translated into eight languages. Over the years, the two have worked closely with a multitude of writers and editors, and collaborated with and managed hundreds of freelance artists, designers and photographers. Their work has been recognized by the American Institute of Graphic Arts (AIGA), the Society of Publication Designers, and they have received design awards from How and Print magazine.